This page describes how to manage the Cloud SDK in Cloud Tools for Eclipse. You can either allow Cloud Tools for Eclipse to download and install an SDK for you, or you can point it to a specific SDK you've installed outside of Eclipse. When you install Cloud Tools for Eclipse, it searches your computer for the Cloud SDK. If it can't find the SDK, then it automatically downloads the latest version of the SDK. It also periodically checks for and installs updates as needed. 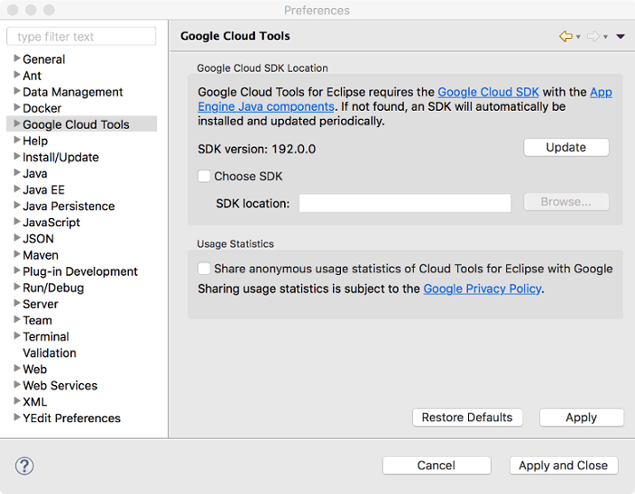 In the Eclipse Preferences dialog, the Google Cloud Tools setting shows the Cloud SDK configuration. When the Choose SDK checkbox is clear, then Cloud Tools for Eclipse is managing the SDK. 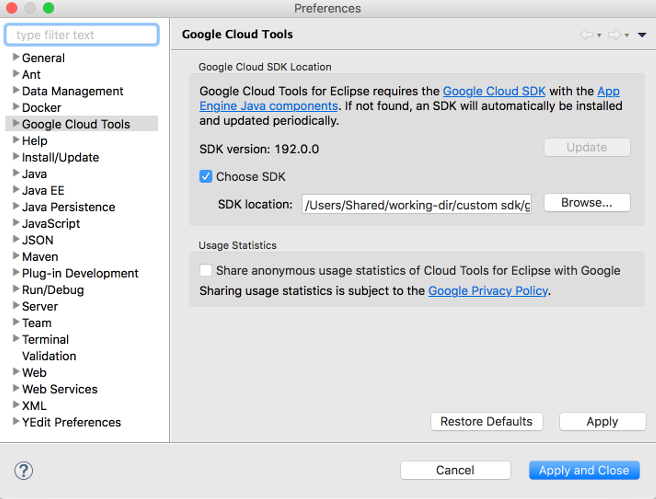 In the Eclipse Preferences dialog, select Google Cloud Tools. Select the Choose SDK checkbox. Click Browse and navigate to the location of the Cloud SDK you want to use. Eclipse uses the specified SDK.